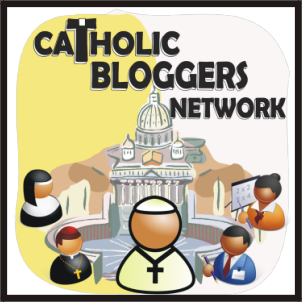 It's been a little while since my last post when I blogged about our Holy Week 2015 plans and then last week I quickly popped into my corner of blog land to tell about my chocolate green smoothie guest post. 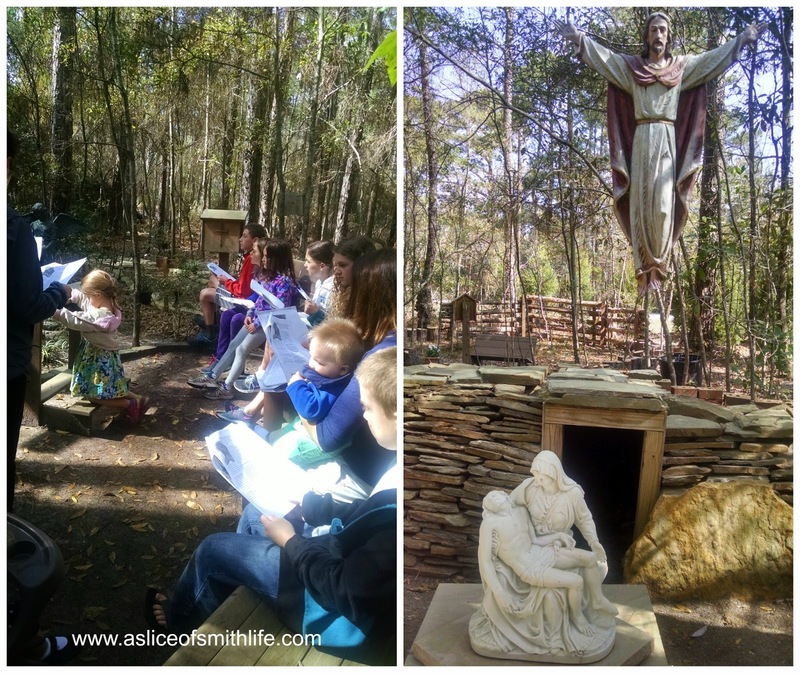 It was a busy week last week and I posted pictures of our Holy Week on my blog Facebook page, but I thought I'd share a little about our Holy Week here. Also, it's still Easter so "Happy Easter!" 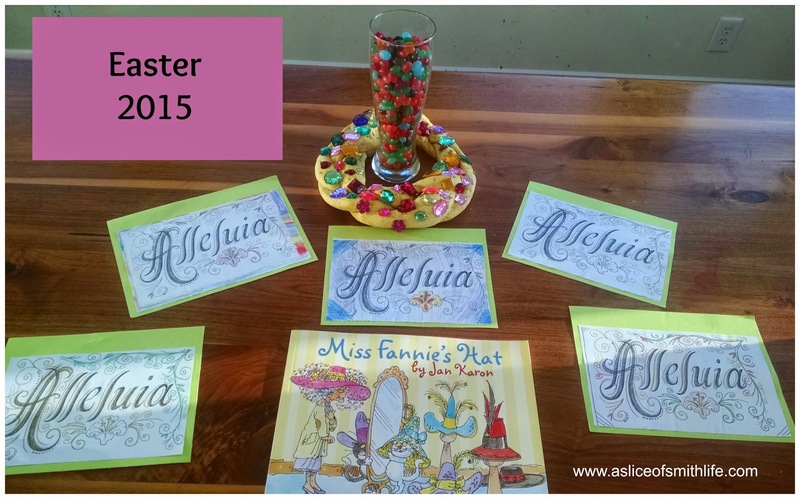 as I share a little about our 2015 Easter fun too. 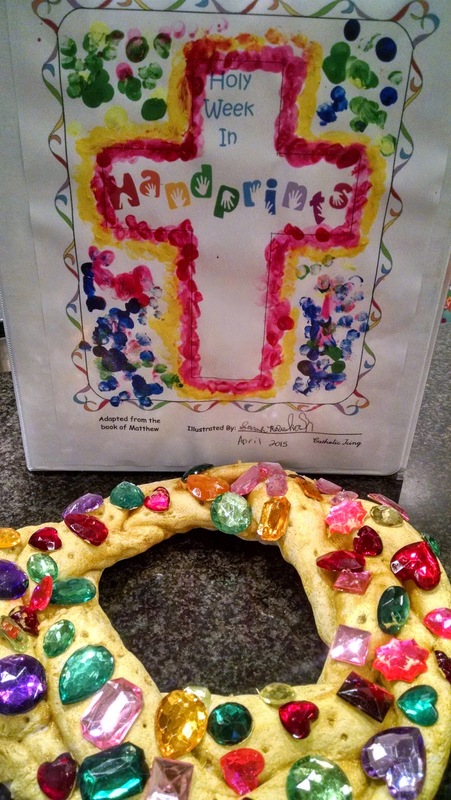 We started and completed our "Holy Week in Handprints" book from Catholic Icing that my 10 and 7 year old daughters enjoyed making. My older 2 didn't get into it and my 20 mo. hates having paint on her hands. It was a beautiful day last Monday, so the project was started outside in our backyard. 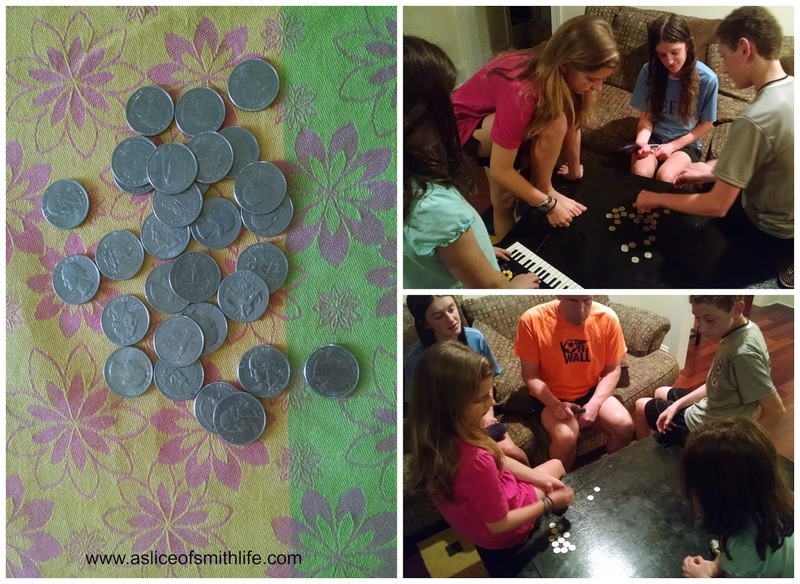 I hid 30 pieces of "silver" for the kids to find. We started this fun tradition last year. 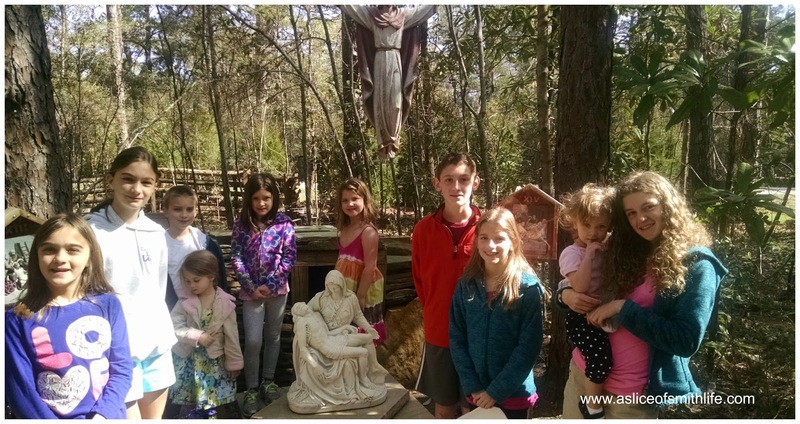 Like last year, we visited the "Via Cruces" (Way of the Cross) with a few families. 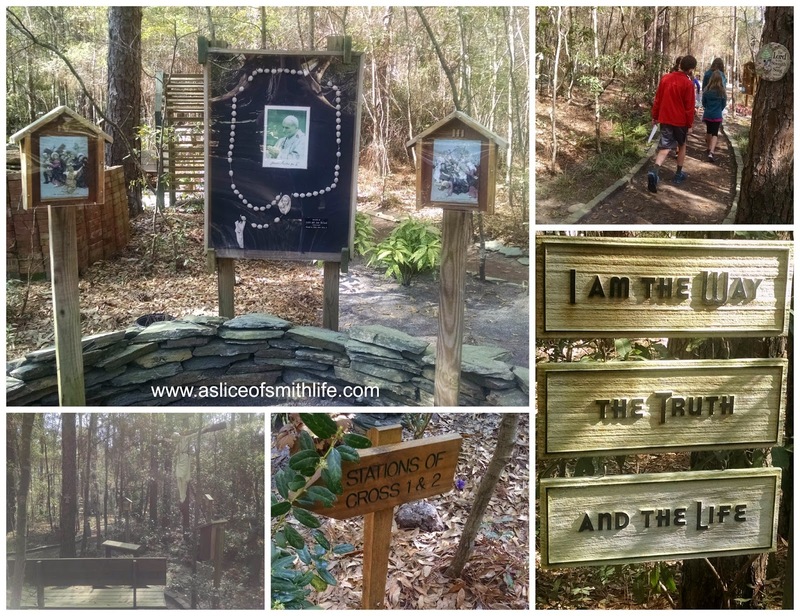 A couple who attends our church has a beautiful garden in their side yard where you can pray the Stations of the Cross as you walk around the long path filled with the stations of the cross, statues, benches, plaques, crucifixes and there's even an empty tomb with a stone rolled away at the end of the path. Just beautiful! 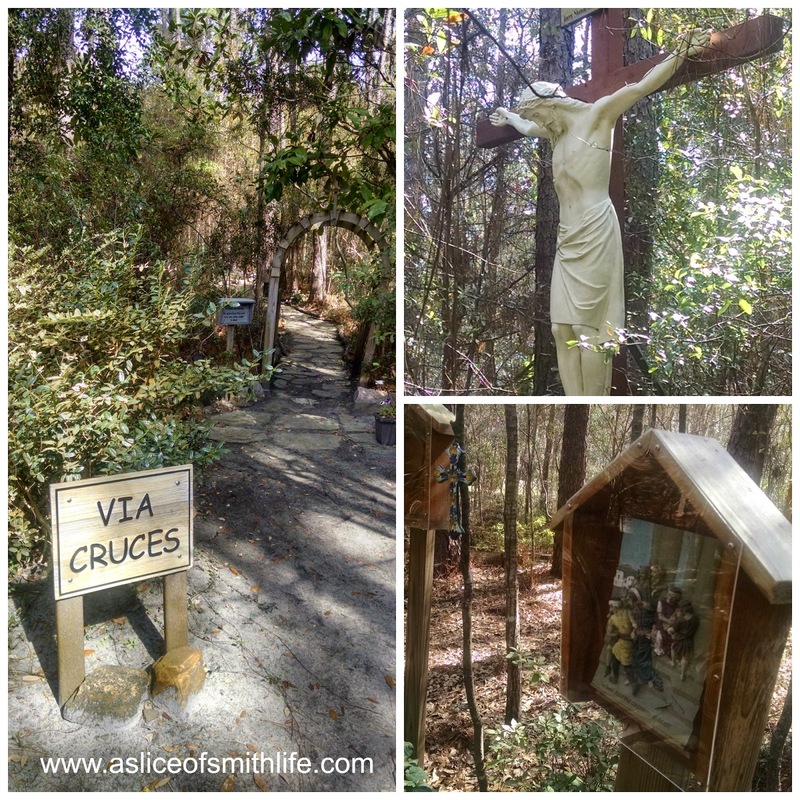 Via Cruces is opened year round and the owners say all are welcome anytime, but I like making it a Holy Week tradition. In the evening, our family went to Holy Thursday Mass and it was a special way to end a beautiful day! 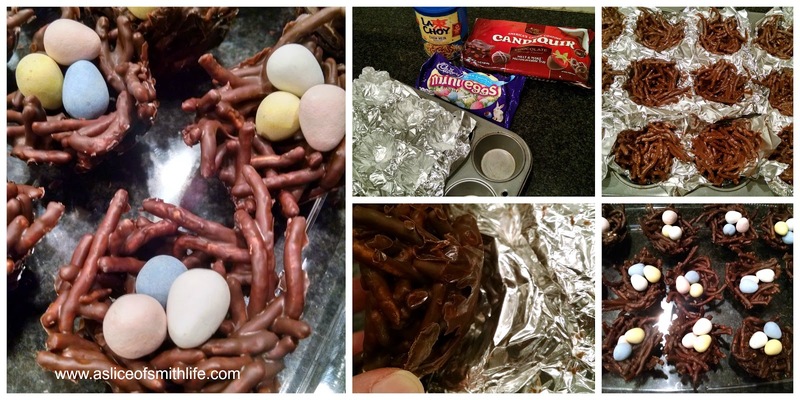 After visiting "Via Cruces", we came home and made some birds' nests to share for Easter lunch and dinner. Very easy and fun to make and yummy too! 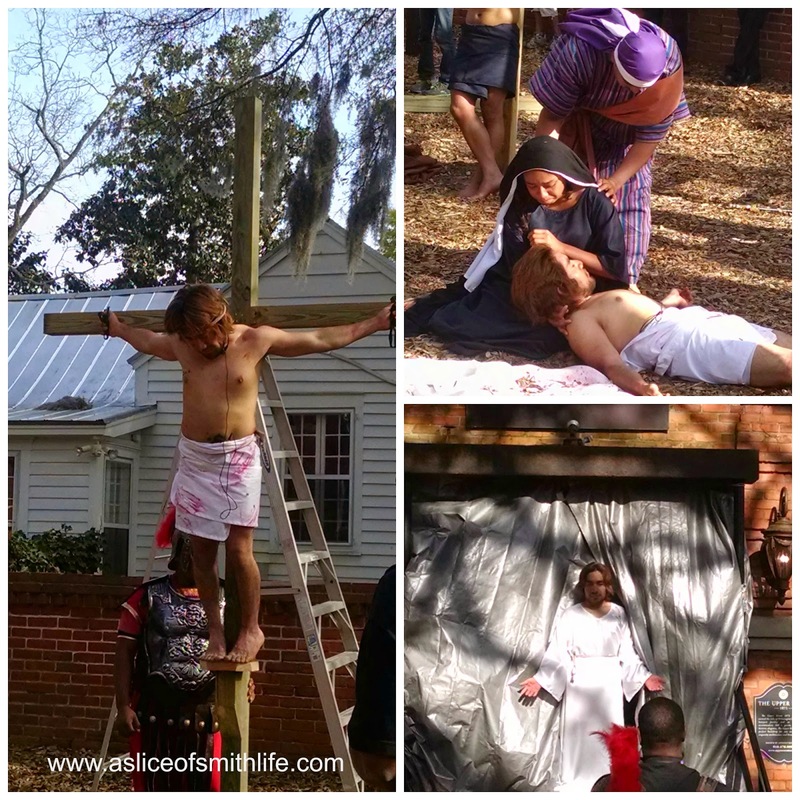 After the Good Friday service at my parent's church, we saw the live reenactment of the Lord's passion, death and resurrection again which is something my kids remember from when we first went several years ago. It is put on by the Hispanic youth and adult community at the parish and although we don't understand the Spanish, you certainly know what is going on. 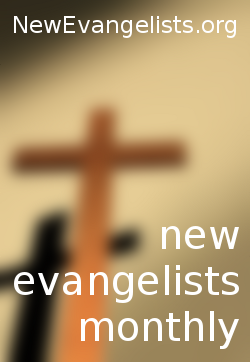 It's a very powerful presentation as the audience followed the presentation to the various stations and locations around the church grounds. There were "guards" taunting Jesus as they kept the crowd away from where Jesus was walking. 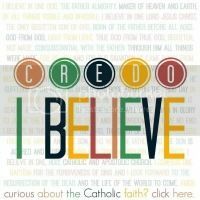 Here's a short video clip of when Jesus died on the cross with music playing in the background. 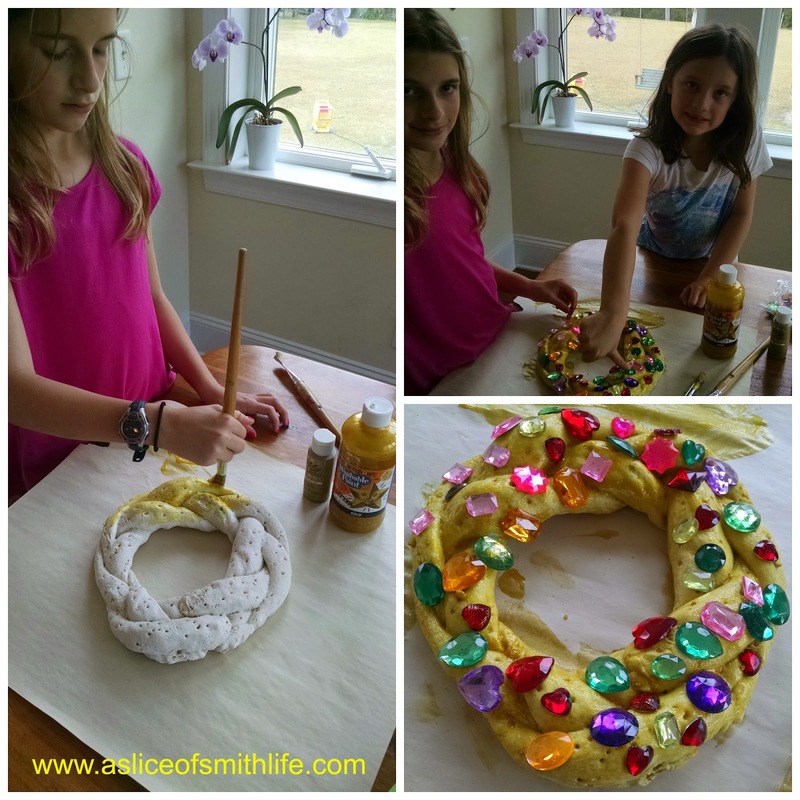 On Holy Saturday, 2 of my girls painted our salt dough crown of thorns with glitter gold paint and decorated it with jewels since Sunday would be the day we celebrate our resurrected King of Kings! We then use the golden crown as a decoration for Easter Sunday. 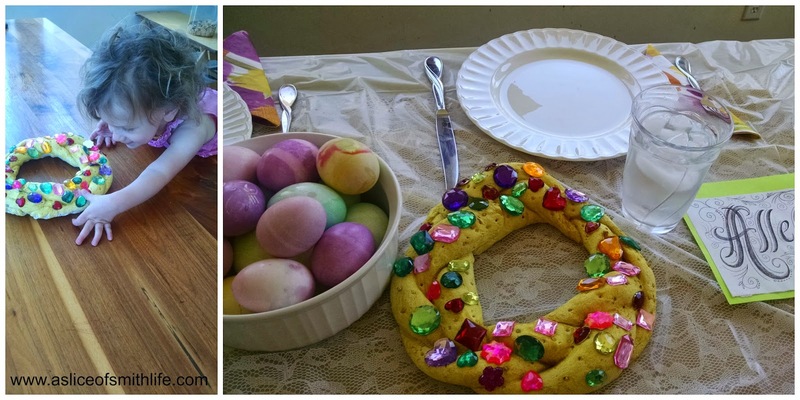 On Saturday evening we made our traditional Resurrection Rolls and Resurrection Cookies. 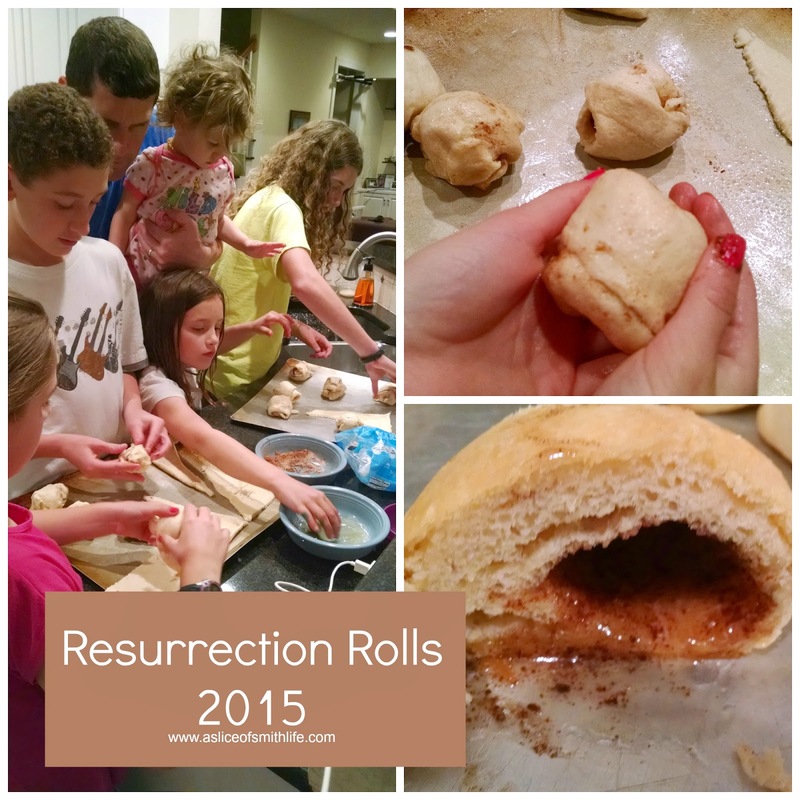 Some of our kids like the Resurrection Rolls the best. For the rolls, the marshmallow represents Jesus' body and then you dip the marshmallow into melted butter, cinnamon and sugar (oil and spices to prepare body for burial) and then wrap crescent roll (linen cloth for burial) around the marshmallow. 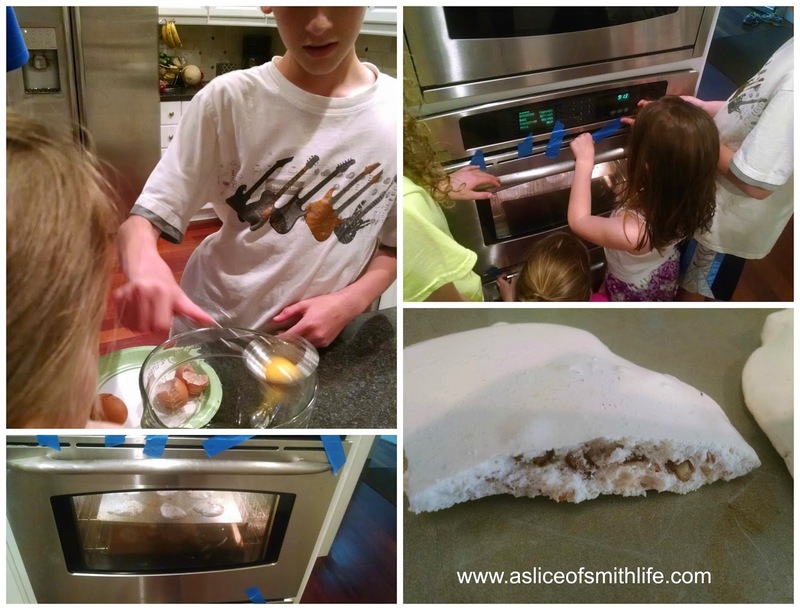 While baking, the marshmallow melts and it looks like an empty tomb inside the bread! The first step to making the resurrection cookies is to chop up pecans in a bag by having the kids pound the pecans with spoons to represent when Jesus was beaten. My kids really enjoy this part of the recipe which seems strange to say since it's representing something so sad. 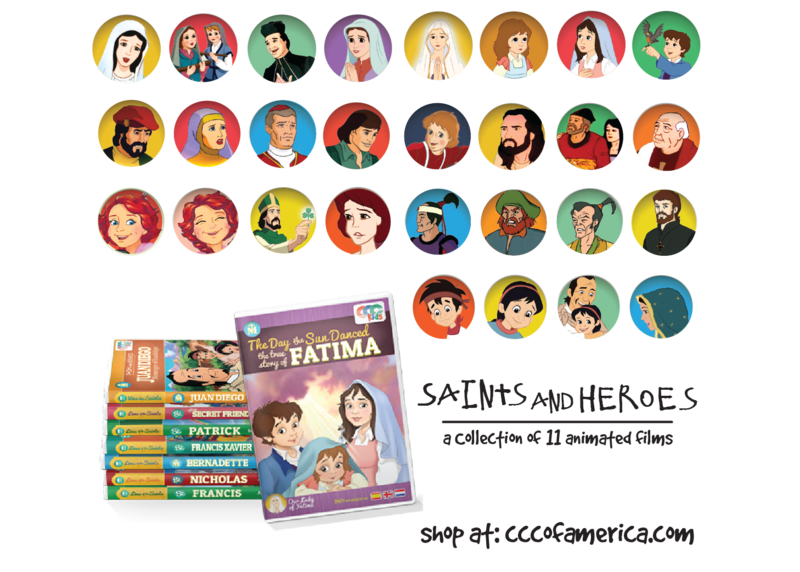 As we continue to make the cookies, scripture is read to tell what each ingredient symbolizes in the Easter story. When the ingredients are finally mixed, they are put into the pre-heated oven and the oven is turned off for the night. The tomb is sealed by placing tape on the oven. 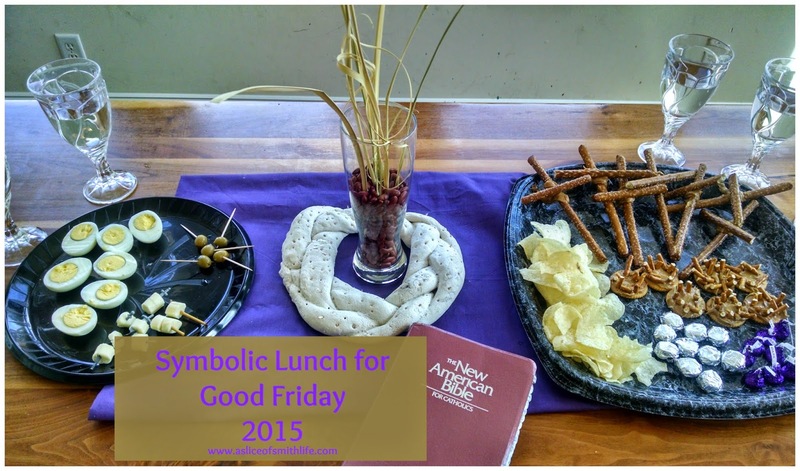 In the morning the cookies are rocky and hollow-like to represent an empty tomb. 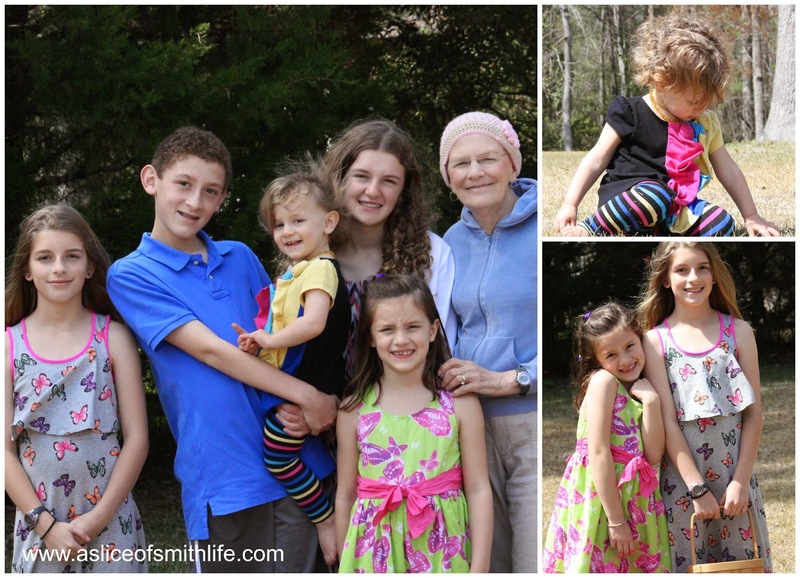 Easter Sunday - Happy Easter! In the morning, our kids woke up to this on the kitchen table. We always hide their baskets in the house and they get to see what is in their baskets after church. On the table is displayed the sacrifice beans from Lent that turn into jelly beans, the "Alleluias" come out from hiding and this year our kids got this sweet story called Miss Fannie's Hat. 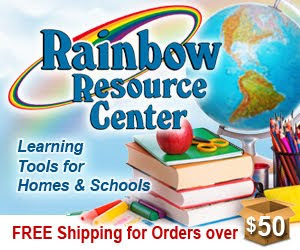 It is a wonderful Easter book that we happened to borrow from our library so I had to buy it. I hope to write a post about it soon since it's that good! This year our oldest daughter sang in the girl's choir on Easter Sunday and she sang with 2 other girls during the Communion song. They all sounded beautiful and they could be heard too! We had to get to Mass an hour early to not only get my daughter to her choir practice before Mass, but also the Church fills up quickly. 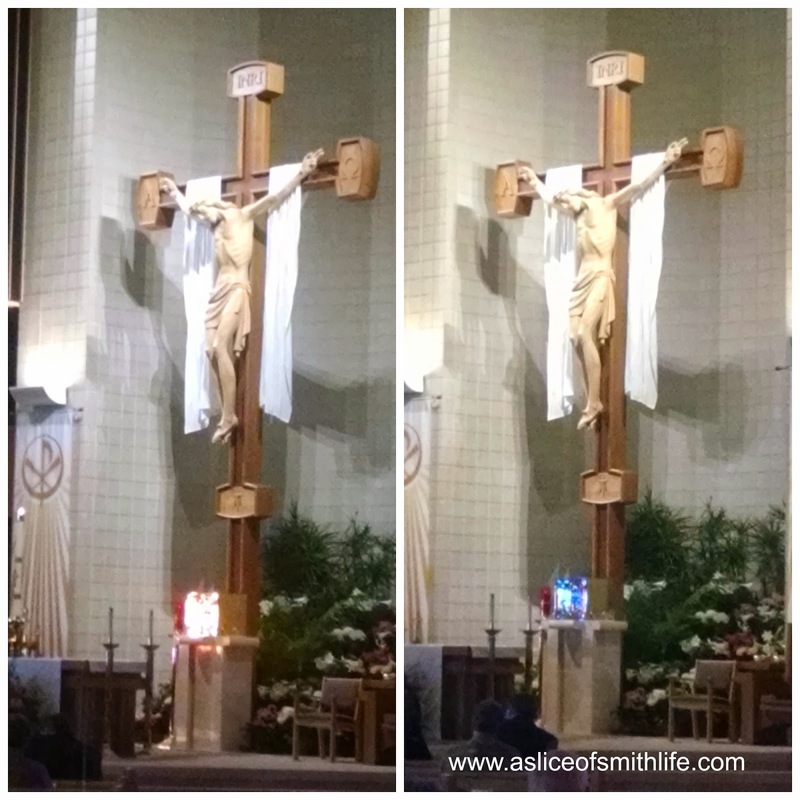 While I was waiting for Mass to begin I noticed from the back of the church that the tabernacle was glowing brightly with gold light just under the huge crucifix at the altar. Then as you walked a few steps the tabernacle shone a Marian blue. Thanks to the morning sun and the stain-glass windows, we were able to see this beautiful site, though I like to think that it was a way for us to remember Christ's true presence in the Blessed Sacrament. 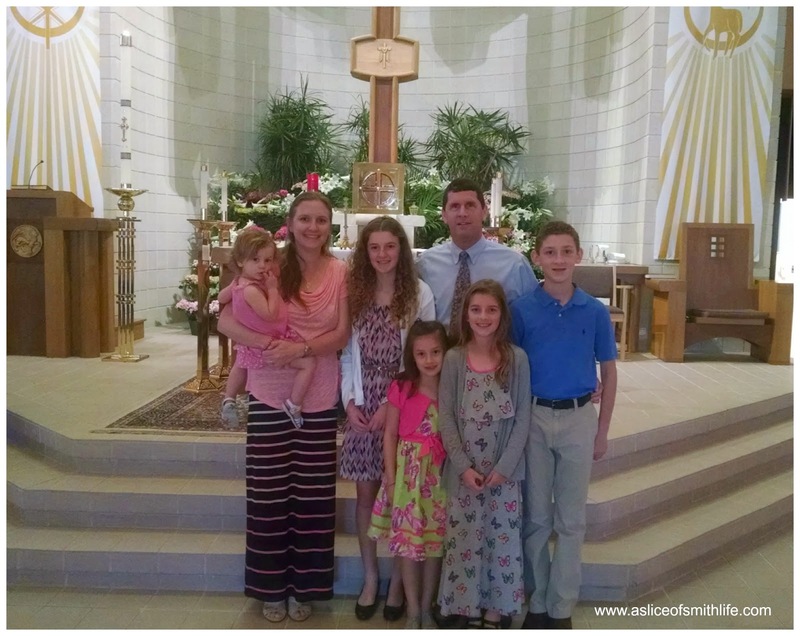 Here's our family after the Easter Mass. 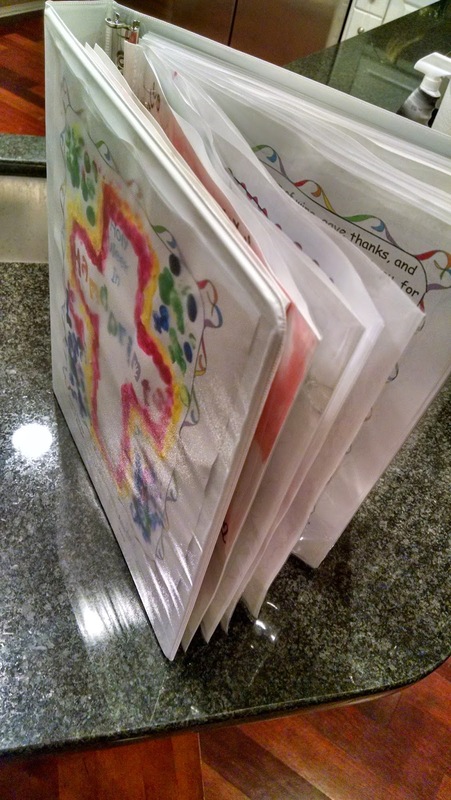 At lunch my kids showed my parents their "Holy Week in Handprints" book that I put in a binder with page protectors to keep for years to come. 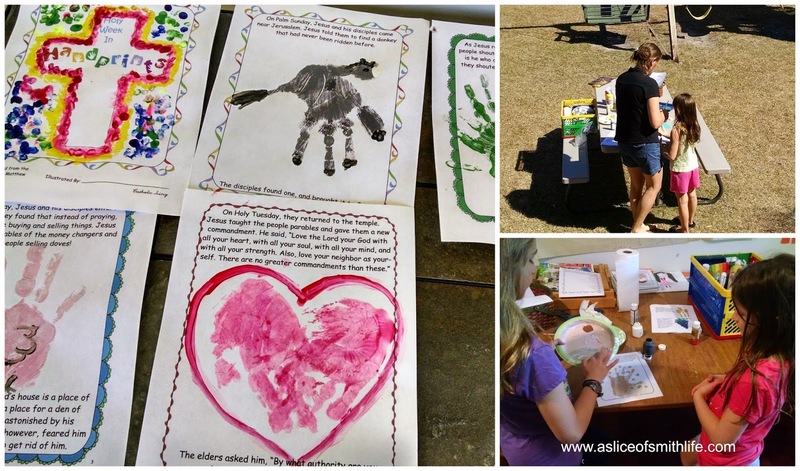 Pictures and an egg hunt outside. My Mom got in the photos, but my Dad was inside icing down a sore knee. 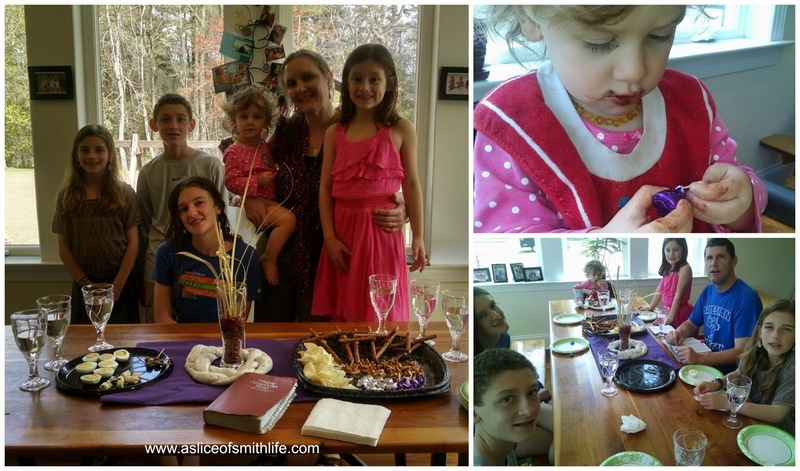 Then it was off to my in-laws house for more food, family and Easter fun. 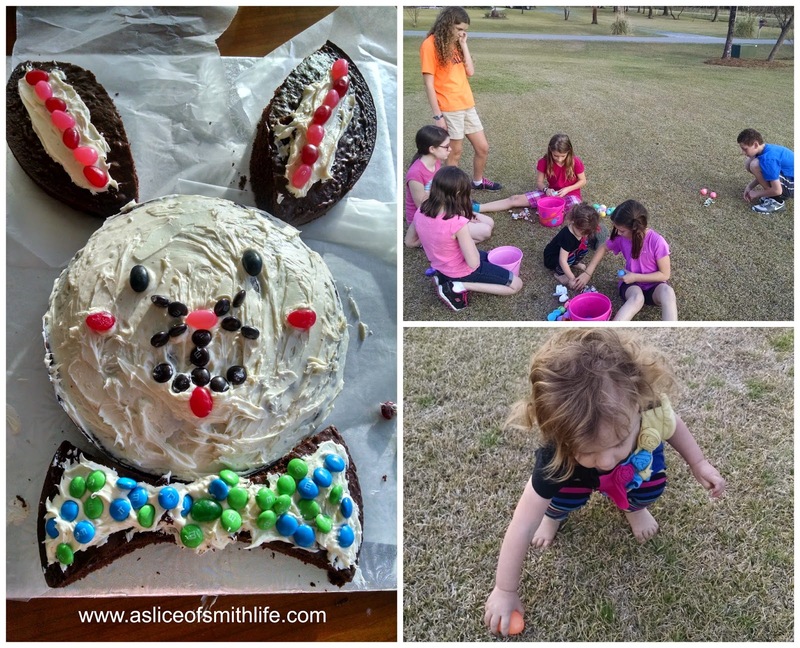 My kids and their cousins decorated this Easter bunny cake. May you have a blessed Easter season! 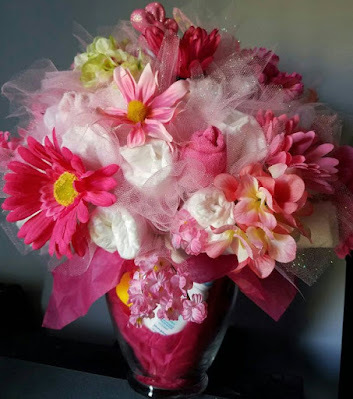 If you are looking for ideas to celebrate the 50 days in the Easter season be sure to visit Nicole's post at Children of the Church where she blogs about 50 Ways to Celebrate the 50 Days of Easter With Your Children. Happy Eastertide, Tracy. As always your post was such an inspiration. 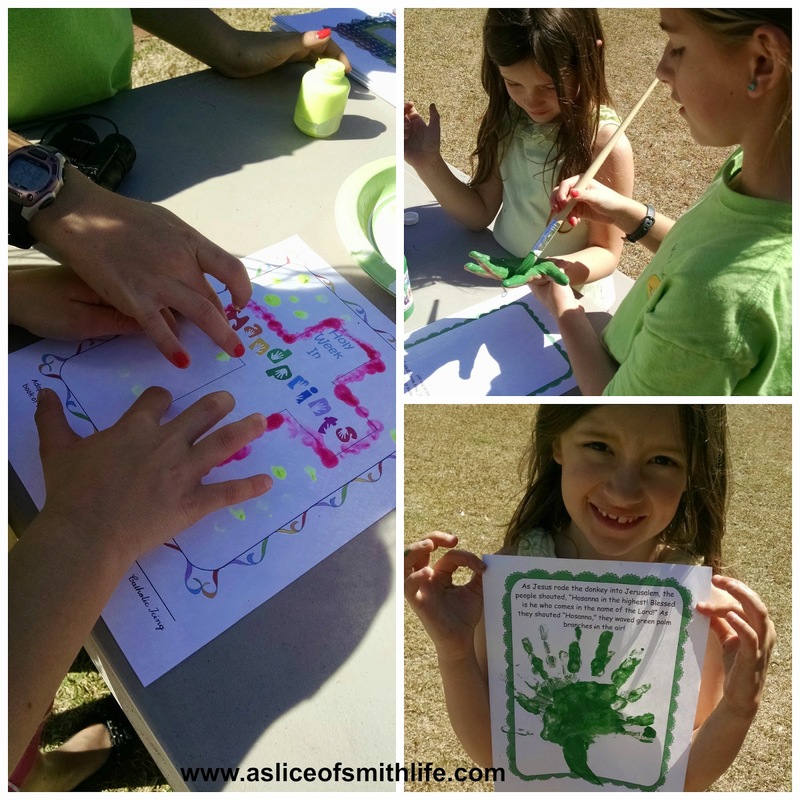 the kids did a fantastic job on their holy week handprints and the transformed crown of thorns. That way of the cross was so beautiful, I wished we lived closer. 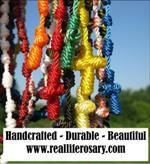 Happy Eastertide to you as well! Thank you for stopping by and if you are ever in this neck of the woods, the Via Cruces would be worth visiting anytime of year!